In case you hadn't heard, a little movie called Batman v Superman: Dawn of Justice is currently filming in and around Detroit, MI. Since we live in the Golden Age of social media networking, set pictures and videos have fueled all kinds of speculation on what's going on in this movie, from Ben Affleck's shoulder injury to Jesse Eisenberg's hair to Scoot McNairy's legs. The most recent set leaks revolved around Batman's ride. Instagram users posted several pictures of the new, updated Batmobile, which was promptly followed by an official photo released by director Zack Snyder. The exciting design appears to be something of a hybrid between the tank-like vehicle used in Christopher Nolan's Bat-films and more traditional, hot rod-inspired Batmobiles of old. Meanwhile, outlets like Bleeding Cool reported a rumor that one of the Batmobiles from the movie's set had been stolen. The rumor was picked up by some of the mainstream media (such as the local Detroit CBS affiliate) before being debunked by the Detroit Free Press. Is Snyder taking a sly, friendly dig at J.J. Abrams and the currently-filming Star Wars: Episode VII? It would seem so, but what if Snyder had used, say, a Joker or Two-Face lookalike - or at least one of their henchmen? The internet would've imploded. This way, Snyder provides fans with a harmless bit of franchise-crossover in the form of this officially-sanctioned bit of fan-fiction. 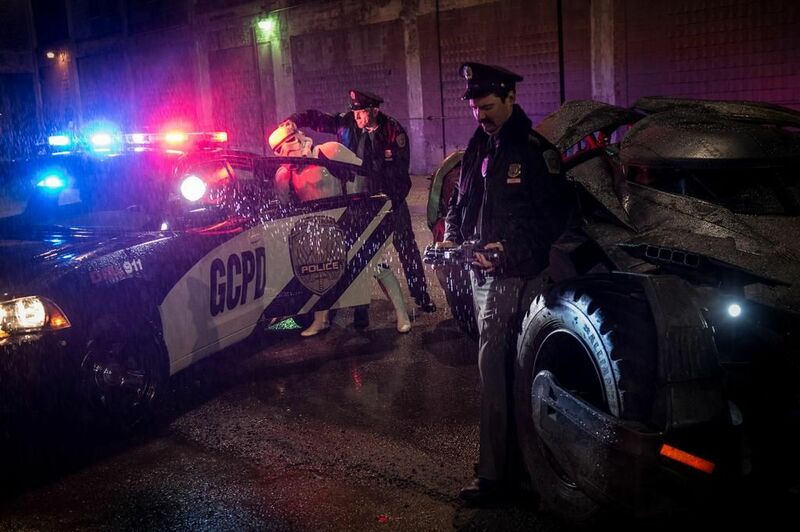 The attention to detail is pretty funny, too - the way the Gotham PD cop nearest the Batmobile is looking at the Stormtrooper's blaster is priceless. Make no mistake, Zack Snyder is following the online fan chatter. He's not above calling in to a Detroit radio show to defend Aquaman's badassery and, apparently, will comment on your Instagram video when the mood takes him. Snyder, whose Instagram handle is @cruelfilms, has removed his comment, but judging by the reaction of the video's other commenters, the fact that Snyder has weighed in at all delights them to no end. The fact that the director takes the time to interact with his fans is genuinely heartening for audience members who may have questioned the decision to hand Snyder not just an all-new Superman and Batman, but Warner Bros. and DC's own interconnected movie universe. The leaked BvS set pictures and videos still don't answer any of the bigger questions about the film's plot and whether or not it will be able to seamlessly integrate multiple superheroes while giving us a satisfying first-time team-up of the World's Finest, but that won't stop us from poring over every image from Detroit that we can get our hands on. Batman v Superman: Dawn of Justice will open in theaters on March 25, 2016.